This clearly is a free program. There is no spyware or adware. It's absolutely safe to install and to run! 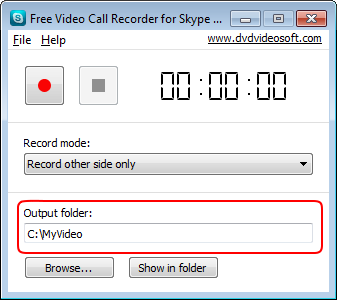 Follow Start > All Programs > DVDVideoSoft > Programs > Free Video Call Recorder for Skype or just click the DVDVideoSoft Free Studio icon on the desktop. The interface is rather simple and self explaining. There are buttons to start/pause/stop the recording and the list of recording modes to choose from. 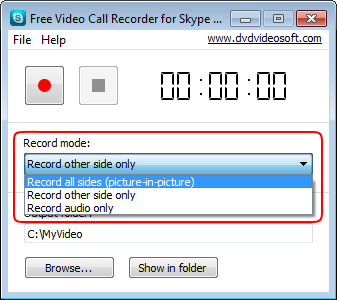 Choose one of the available modes from the drop-down list: record all sides, record other side only, record audio only. Click the “Browse...” button to select the output folder. Start a Skype call. After that click the Start button. 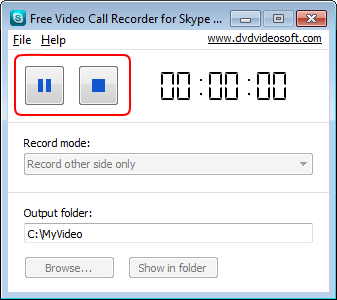 To stop the recording, use the buttons Pause/Stop. Open the output folder by clicking the “Show in folder” button.